Celebrity chefs have reached rock-star status, and the number of aspiring talent is rising. … But the fast-paced, everyday pressures of the restaurant industry are anything but glamorous as wannabe chefs struggle to climb the culinary ladder. So, who can really handle the pressure of cooking under fire? That's the question PBS will answer in the brand-new prime-time reality series Cooking Under Fire premiering Wednesday, April 27, at 8pm (check local listings). Served up as "reality TV that feeds your brain," the documentary-style series will track 12 contestants as they embark on a coast-to-coast cooking competition in four of the nation's culinary capitals — Los Angeles, Las Vegas, Miami, and New York. The show will share an insider's look at the mental and physical challenges and intense pressures faced in the today's highly competitive restaurant industry, and the combination of talent and skills that it takes to succeed. It's reality TV — the way only PBS can do it! 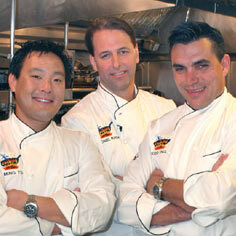 The contestants will be judged by famed chefs and restaurateurs Ming Tsai and Todd English, along with author and trained chef Michael Ruhlman (The Soul of a Chef, The Making of a Chef) — as well as an impressive panel of local guest chef judges — as they face cooking challenges, difficult deadlines, and the heated pressure of working against the clock. Those who fail to execute will be "86'd" — taken off the competition menu and sent home. The contestant left standing will win a life-altering culinary prize — a chef position at one of restaurateur Todd English's New York City restaurants. Tune in to find out who can handle the heat! Corporate funding for Cooking Under Fire is provided by Chrysler, Contessa Premium Foods, Inc., and All-Clad Metalcrafters, LLC. Additional funding provided by public television viewers. Produced by Lance Reynolds Productions/A Better Machine and WGBH Lifestyle Productions. The name and logo are trademarks of WGBH Educational Foundation. Executive producers are W. Lance Reynolds, John Rieber, and Laurie Donnelly.